Boston Police report officers investigating gunfire on Brook Avenue around 3 a.m. were looking for a man witnesses spotted dashing into a house after the retorts when they shined their flashlights on 42 Brook Ave. - and spotted a man at a second-floor window duck down: Read more. Murder scene. Photo by KMV. 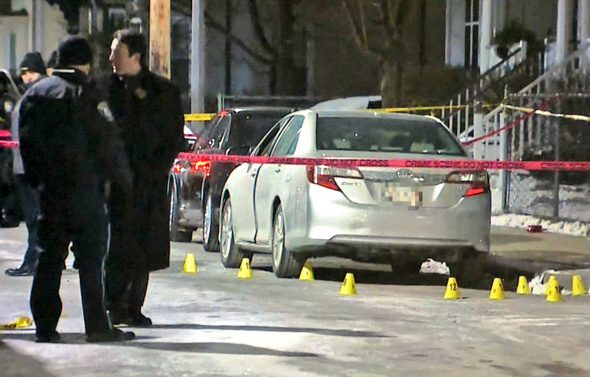 Boston Police report a man was shot around 9:35 p.m. at 102 Brook Ave. KMV reports the man, believed to be in his 30s, was shot repeatedly as he sat in a car. In the leg, at Brook Avenue and Dudley Street, around 9:20 p.m.